Finally! After years of advocating the legalization of marijuana, I can't believe that I'm actually witnessing it all happening! And supposedly with this new dolt as Governor in New Jersey, we're supposed to legalize it here to, though I still believe he only said this to get voters, but I guess we'll see. Anyway, San Francisco too a huge step in the legal marijuana age with a dispensary that was more like an Amsterdam-style cafe lounge. 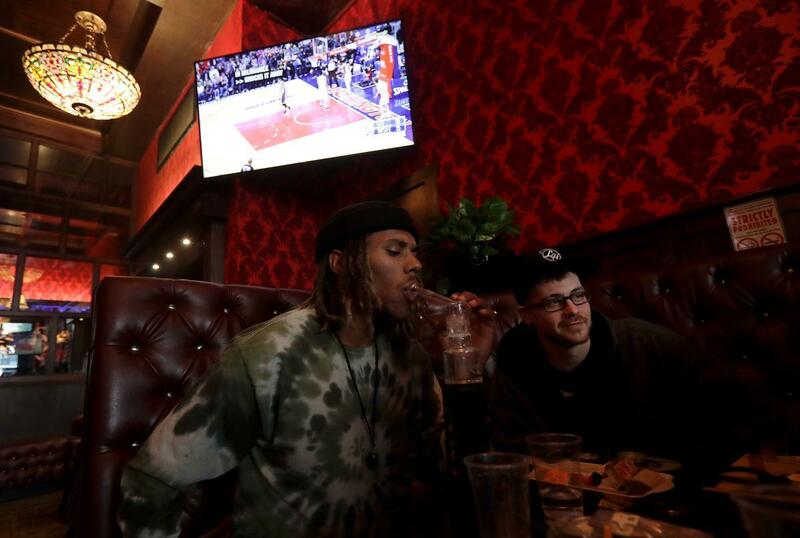 The Barbary Coast Dispensary's marijuana smoking lounge is a darkened room that resembles a steakhouse or upscale sports tavern, which it probably was before, with its red leather seats, deep booths and high dividers, and hardwood floors. "There's nothing like this in Jersey," grinned a visitor from Atlantic City, NJ, as he was getting high with his cousins. 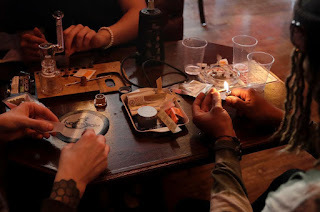 To be honest, there's nothing like the Barbary Coast lounge almost anywhere in the United States, a conundrum for many marijuana enthusiasts who find it increasingly easy to buy pot but harder to find legal places to smoke it besides their own homes. Only California permits marijuana smoking at marijuana retailers with specially designed loungers. But it also allows cities to band those kinds of shops. It's no surprise that San Francisco is the trail-"blazer." It's the only city in the state to fully embrace the Amsterdam-style coffee shops, the iconic tourist stops in the Netherlands where people can buy, eat, and smoke marijuana in the same shop. I mean come on...The home of Haight-Ashbury? Are you really surprised? You can drive through that neighborhood and get high. It smells like Patchouli the minute you walk into it. San Fran's marijuana "czar" Nicole Elliot said her new permits will be issued once the city health officials finalize regulations designed to protect workers from secondhand smoke and the neighborhood from unwelcomed odors. The lounges are required to install expensive heating, ventilation and air conditioning systems to prevent the distinct marijuana odor from leaking outside. Other California cities are warming up to this idea. Oakland and South Lake Tahoe each have one smoking lounge. The city of West Hollywood has approved plans to issue up to eight licenses, the tiny San Francisco Bay area town of Alameda said it will allow two and Oakland and South Lake Tahoe each have one. Sacramento, L.A. and other cities are discussing the issue, but have not authorized any lounges yet. The city of Los Angeles' business development manager said residents and cannabis businesses complain there is "no safe place, no legal place, to use it." She continued to say that Los Angeles officials envision smoking lounges to be set up like traditional bars, but for now the idea is more concept than plan. In Colorado, one of the first states to broadly legalize, lawmakers failed in a close vote to make so-called "tasting rooms" legal. However, cities may do it, and Denver has authorized loungers where consumers bring their own marijuana, issuing permits so far. Nevada has put off a vote on the issue until next year, while lawmakers in Alaska and Oregon have considered and rejected legislation. The Barbary Coast, which received its state license in January, first opened as a small dispensary in 2013. It expanded and opened its smoking lounge to medical users last year. On January 11, the shop opened to all adults when it received its California recreational use license. The state started issuing those on January 1 and continues to approve dozens of applications a month since voters broadly legalized the use and sale of marijuana. Man....moving to California is looking better and better every day!